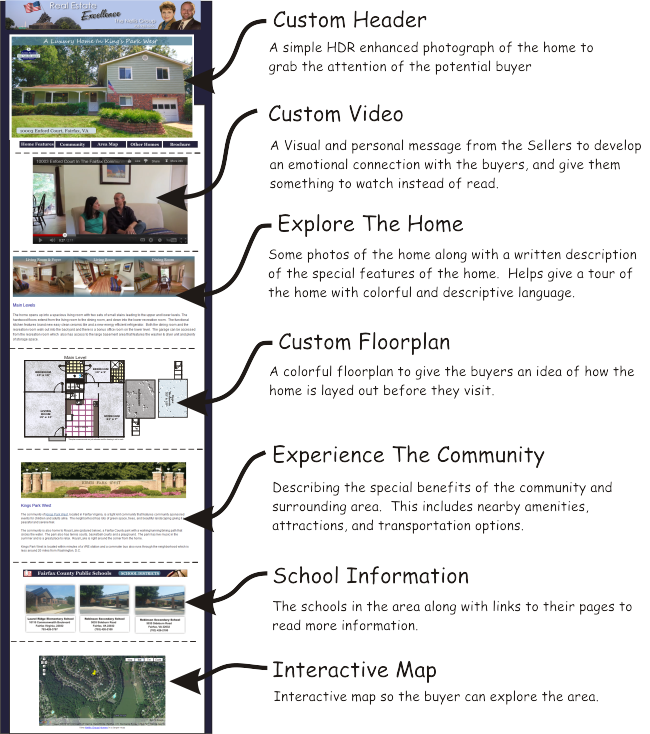 Marketing tools used by The Robbins Team to sell your Wilmington home. The Berkshire Hathaway HomeServices powerful suite of marketing solutions. The Robbins Team's additional extraordinary marketing solutions. Our goal is that everyone who visits your home, leaves thinking about your home. The brochure is deigned as a takeaway for people who have seen your home and viewed it. This is usually 50-80 pages of information filled with photos of the property, descriptive text, aerial photograph, information on the local public schools, the local politicians, disclosures, maps and much, much more. Another way to publicize your home is by sending out flyers to your neighbors. These brief color flyers give a description of your home and a few color photos. They are designed to let neighbors inform their friends and co-workers about your home. We don't just toss your home online and into social media. We interconnect each aspect together so that everything leads back to your home in an integrated social fusion. We want your home to dominate the internet community. Through a series of virtual tours, videos, blogs, microblogs, and social media we drive the online traffic directly to your home. Much like the on line property brochure above, we will develop a unique page for your neighborhood as well. Our goal is to give buyers a favorable look at one of the major things the will be buying - the neighborhood. In today's market you can't afford to have your home just sitting and waiting on the internet. We send out three strategically timed blogs. The first describes the advantages of your home and community. The second is a video blog, and the third is a feature of some of the popular amenities and attractions near your home. We use Facebook and Twitter to create traffic for your property. These near instantaneous forms of communications allow people to pass the info onto friends and friends of friends and are becoming integral to our business. This optional program allows you to test the water (market) before actually putting the home in the Multiple List System (MLS). Sometimes you do not want the general public/neighbors to know when your home is for sale or sold. We will still contact the top area realtors and cooperate with all members of the MLS.